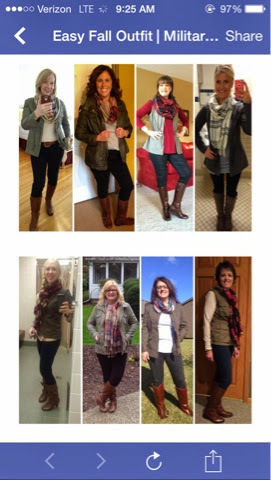 Several of you have asked me to continue posting outfits from the Get Your Pretty On: Style Me Pretty Fall Challenge. I've been having a lot of fun getting to know the 1,200 people participating in the challenge, through our private Facebook group. Seeing all of their outfits and the way they are styling something, is super fun! And inspiring. And, um, I'm pretty much a celebrity this week. Allison posted this collage on her main blog and there I am!! Eeeek! 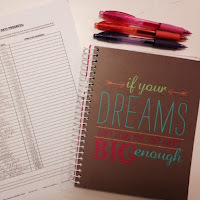 (Upper right) She chose a handful of women to feature on her blog and I'm still in shock she picked me! How fun! Who doesn't love a good selfie in the staff bathroom. I mean, really. Nothing says fashion like a toilet and seat covers. ;-) The lighting and mirror are so much better than my bedrooms, so it's a good alternative! 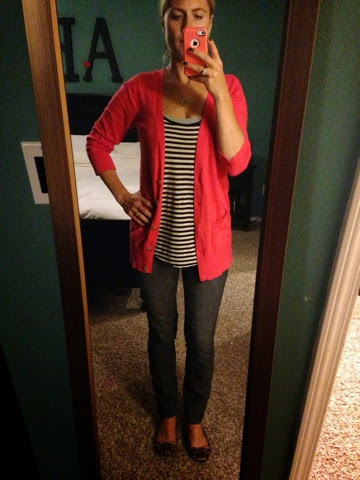 And if you remember from this post, I got this super comfy cardigan at Costco! I think they still have them in a variety of colors. This sweatshirt/wrap is from Nordstrom and when I posted in on the Facebook group, there were about 2347923874892 women who went crazy for it! It's really one of my favorite pieces in my closet and can be worn either as a wrap or a cardigan. If you want to order it, click here. It happens to be on sale for $39! Score. 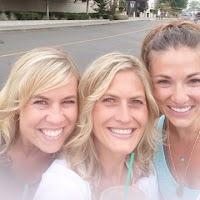 This post is linked up with some fun ladies...check them out here! 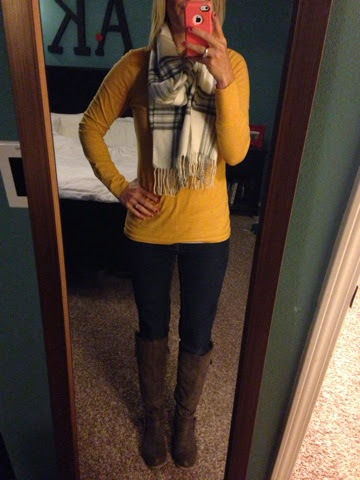 I love the yellow top with the plaid scarf! 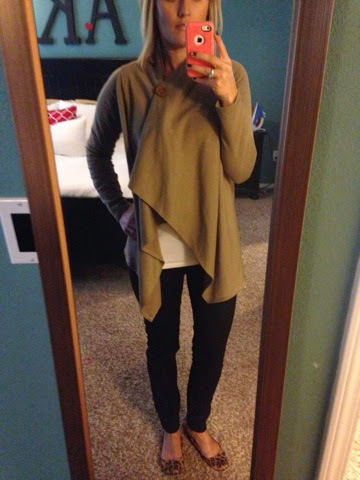 Your CostCo cardigan is such a great find and the sweatshirt wrap is such a cute piece! You are great style - love your outfits. 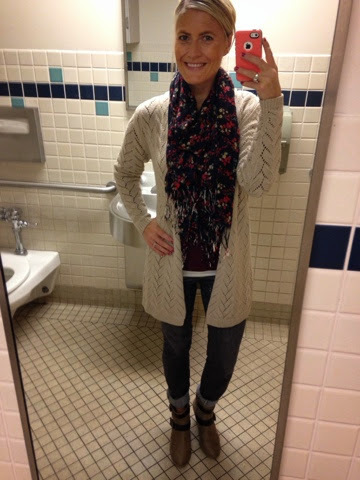 The mustard sweater with the plaid scarf and the outfit selfie in the bathroom are my favorite. 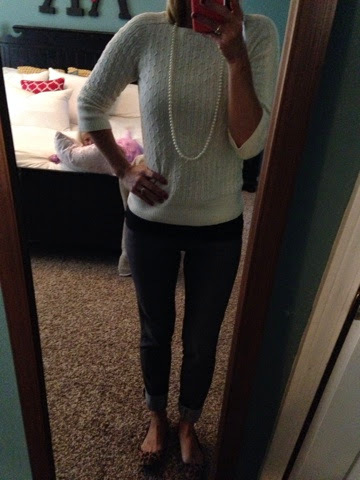 That oatmeal cardigan is great piece! Glad you linked up! I bought the sweater/wrap! Thanks for sharing! 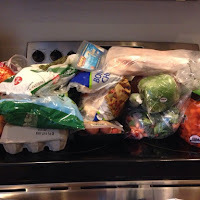 I'm a frequent Nordstrom online shopper and would have never found it if you wouldn't have shared! You won't be sorry! It's the best! What color did you get? 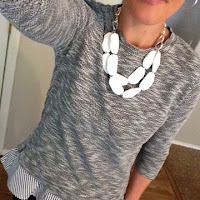 Did you see that the blue and white striped one was just marked down to $19?! I'm tempted! !